You can never have too many basic tools around. 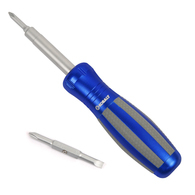 Here is a free Kobalt 6-in-1 screwdriver from Lowes. Register for an emailed coupon that can be redeemed at Lowes. Thanks to slickdeals for the link. I sincerely hope you make a lot of money from these affiliate links, because - frankly - these posts have nothing to do with personal finance and deteriorate the quality of your blog. Thanks for feedback. These aren't affiliate links -- I post them because I believe useful "free stuff" is something readers want to be informed of. Frugality is definitely part of my wealth building strategy. I'd like to get some more feedback from other readers, I'll stop posting them if they are not of value. Please continue - I love useful free stuff! I like them. Keep posting them and keep up the good work! I do not perceive your blog as one of the frugal ones - at least not to the extent of promoting free 'stuff'. I can be in the minority though. nono: I don't understand what the problem is. Even if you aren't frugal, free stuff is never bad. Any money saving/earning tips are welcomed here!